30 th June 2015, Singapore – Recently, some thief made off with my camera backpack along with some of my working gears while I was doing a wedding shoot. Well that was another story, and so, I recently met up with Schmidt Marketing Photo Singapore who happened to be the sole distributor for the German brand Cullmann. I shared my mishap with them and how my gear got stolen along with my Lowe Pro Backpack etc and to my surprise, they passed me a camera haversack to replace my bag (but not the gear haha). Photo: The Cullmann XCU 400 carried over the Top Handle. It is a sturdy looking bag that looks really tough to start with. I closely inspect the bag and it is a backpack from Cullmann. I always thought Cullmann only manufactures tripods which they are so famous for, but a bag? The label reads “Cullmann XCU Outdoor DayPack 400”. It’s a mid-size back pack which is slightly smaller than my stolen Lowe Pro measuring at 210mm (H) x 280mm x 130mm (D). The XCU 400 were made from water resistant material and the there’s a hard base that actually made the backpack stand on its own. The hard base is made of a hard rubber that provides cushioning in the event of a fall for the gear. I later came to know that the XCU can withstand rain – long enough until you find yourself a shelter – which is perfect in most outdoor scenarios. Like most camera back packs of today, the XCU 400 has a front flat compartment for your laptop, iPad, books etc and also a dedicated metal buckle (top and bottom) for fastening a tripod. 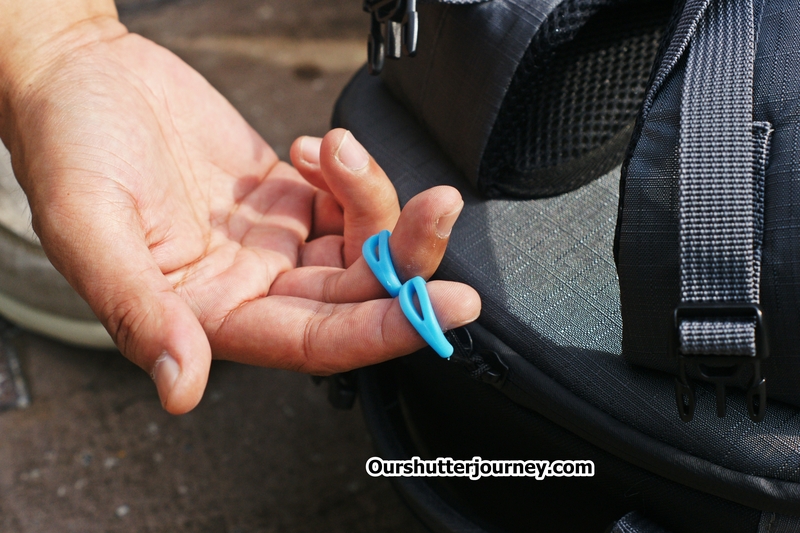 One side pocket opens to a quick access to your camera and on the opposite end a pocket for water bottles with a draw-string fastener. So far so good, pretty happy with what I saw. Taking the XCU 400 out, it just feels really right. The size is average and the design is sleek and kinda low profile if you ask me. The adjustable straps are comfortable and it allows several configurations to fit the activity that you are doing. (Waist straps, toggle straps, chest locking straps, angle locking straps). 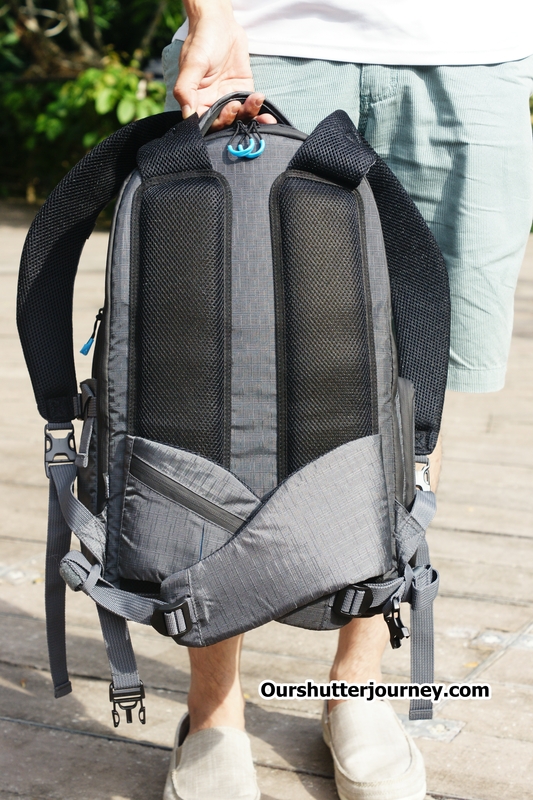 And the back of the back pack opens up to the inside where gears are held closely by a removable padded compartment. The back cover is ventilated with a centre air channel for fast cooling and the design is aimed at achieving the ease of use by reducing weight stress to the user. And both back-straps comes with locking buckles too – nice! Photo: Nice Zipper Finger Rests. The brightly coloured (blue) heavy-duty zippers features a finger-rest that allows the user to zip and unzip really fast which translate to fast operation. This is important for outdoor adventures and sports. And personally I like the thick and cushioned top carrying-handle. Everything about the XCU 400 is just right for my usual usage so far. Time to venture into the insides of the XCU 400. Photo: Buckle Locks for back straps. 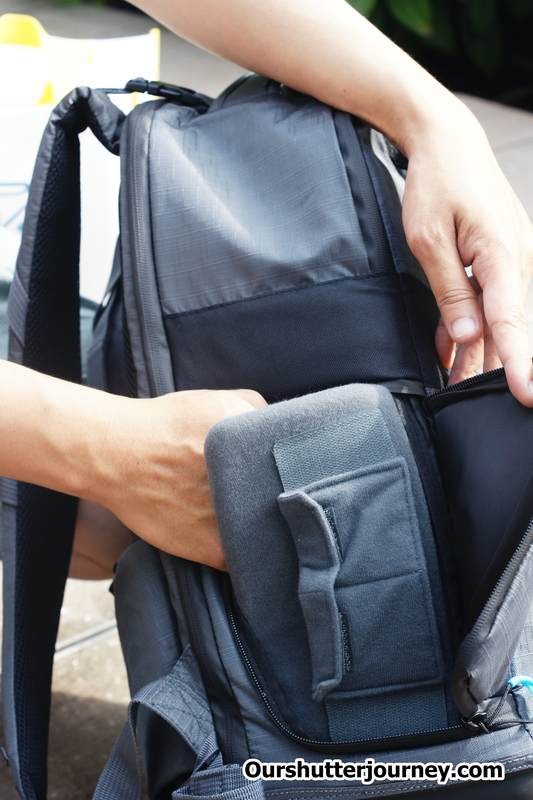 Opening up the XCU 400, there are the standard zipper compartments on the back cover, 2 to be exact which are generously sized so you can have all your batteries, lens covers, body covers, memory cards and other knick knacks stored safely. Photo: The Cullmann XCU 400 inside. In the main compartment, there is the customizable thick-padded compartment with tough looking dividers that you can configure in any way you like it to fit your gear or arrange the way you want it. And that only takes up about 2/3 of the main compartment leaving you a 1/3 space that you can carry other personal effects with you. 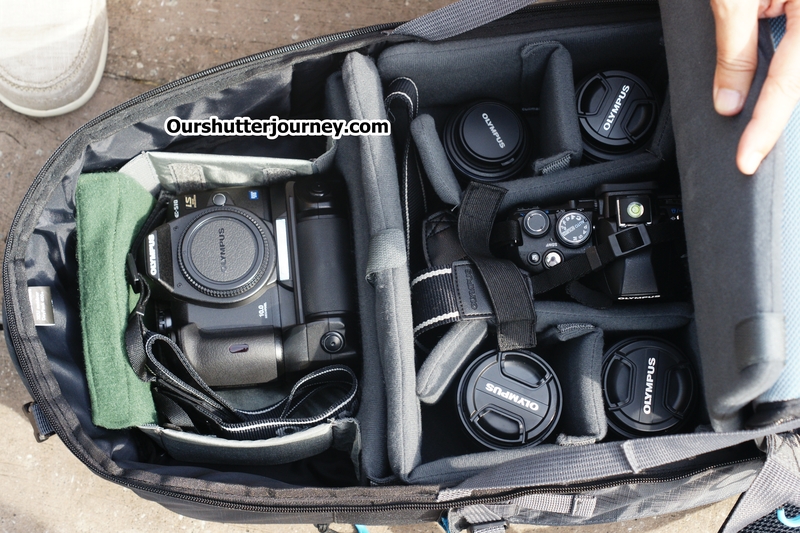 As for me, I created another padded compartment using padded dividers so that I may carry one more camera body with me. This works for me, so basically anyone can customize the insides of the XCU 400, just the way they want it. Photo: The Side zipper opens up to a direct access to the inside of the XCU. To summarize, the Cullmann made XCU 400 is a tough guy. Designed for harsh elements and weather, I must say I am surprised at the overall quality. Well designed, nicely planned out, tough material and high quality this is an excellent camera backpack that will be worth my every single dollar. And from a Tripod manufacturer at that! Photo: The back cushion of the Cullmann XCU and the overall smart design. Thanks Schmidt Marketing Singapore for sponsoring me the Cullmann XCU 400! It will be put to really good use! Thank you! Thanks Trisha Lim for the Behind-the-scenes photos. This entry was posted in Brand: Others (Cosina, etc), Featured Photography Merchants, Group Test & Reviews and tagged Camera Gear, Cullmann, Cullmann XCU 400, Schmidt Marketing, XCU400. Bookmark the permalink.